It is very important to take good care of your hair extensions for expanding its life expectancy and beauty. Just like your real hair, our Virgin hair can also be permed, colored, highlighted, straightened, curled, washed, blow-dried. Treat your virgin hair like your own hair. Using products that contains harmful ingredients (alcohol and sulfates) affects the natural state of the hair. We recommend using water based products, as they add moisture to your hair, not grease. For moisturizing – Use One N Only Argan Oil with water or a water based moisturizer. Organix Anti-Breakage Keratin Oil is another great daily light moisturizing oil. 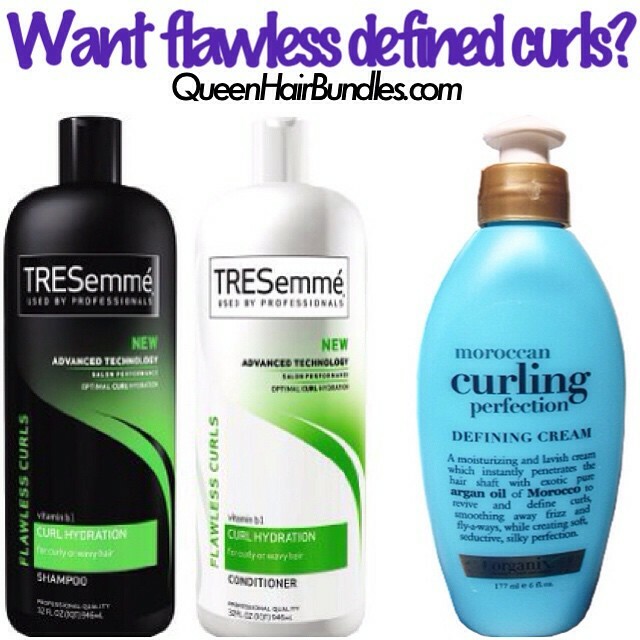 Defining your Deep Wave, Deep Curly, and Malaysian curly textures – Tresemme Flawless Curl Hydration Shampoo and Conditioner with Organix Curling Defining Cream. For our deep wave, deep curly, and curly textures we recommend using Tresemme Flawless Curl Hydration Shampoo and Conditioner. Then complete it with Organix Curling Define Cream. Using these products for curly textures truly moisturizes, defines, and individualizes the curls. We also recommend for daily maintenance, use a spray bottle mix your favorite moisturizing conditioner every other morning. Weft Sealant – Minimize shedding by sealing your weft with Aleene’s Fabric Fusion. There are many YouTube tutorials on how to use this method correctly. Aleene’s Fabric Fusion can be purchase at Walmart, Michael’s, or any fabric store. – Before installing your virgin hair, conditioner wash (co-wash) hair first with a moisturizing conditioner like Organix Moroccan Argan Oil conditioner. – Brush and detangle your hair prior to washing with paddle brush or wide-tooth comb. – Do not cut the wefts or tracks of your virgin hair. This will cause shedding. Your stylist or you should use the fold over method to install the hair. If the wefts must be cut please seal with weft sealant prior to installing. – Co-wash hair at least once a week. Do not over shampoo your hair, this will cause dryness. Shampoo 1-2 times a month. If your hair feels heavy or oily please use a clarifying shampoo. – Air dry your virgin hair. Squeeze out excess water and air dry hair. – When coming hair, gently comb hair with a paddle brush or wide-tooth comb. Begin combing small sections at the ends, working up towards the scalp. – When styling with heating tools it is very important to use a heat protectant serum or spray that is ALCOHOL FREE. Oil base product and alcohol will fry the hair. – Prior to bedtime, wrap, braid, plait, pin curl or roller set your hair and use a satin/silk cap or scarf. – Prior to going swimming wash and leave the conditioner on your hair. This will help prevent the salt water and chlorine from drying out your extensions. – If you bleach, tint, perm, or use extreme heat on hair you risk drying out your hair extensions. This might cause your hair to shed and tangle. We cannot guarantee the longevity of any hair that has been processed or chemically treated. Deep condition hair after chemically treating hair. – If you notice your hair is starting to get dry, sheds, damaged, or tangles, use silicon mix to deep condition the hair. After washing hair – Saturate and let silicon mix sit in hair for 1 hour or more. For super deep conditioning, place hair in zip lock bag then microwave for 60 seconds. Let hair sit in bag for 1 hour or more. Wash out thoroughly with lukewarm water.